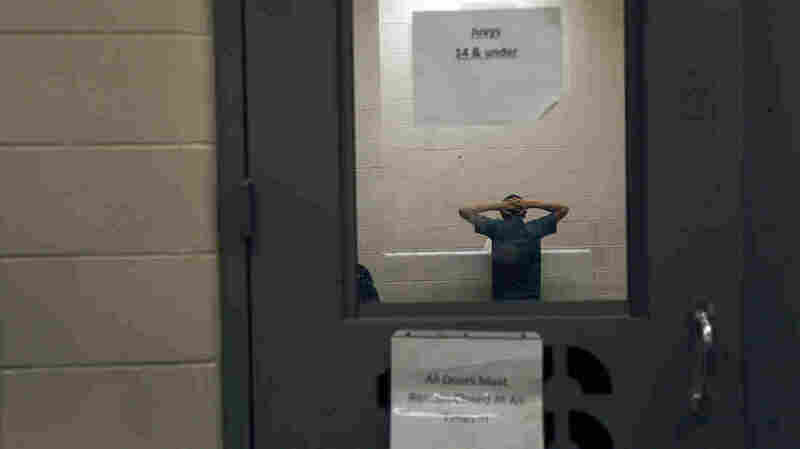 Trauma Plagues Many Immigrant Kids In U.S. Illegally Social service agencies and nonprofits are scrambling to figure out what they need to do to help the thousands of immigrant children who have come to the U.S. in recent months. One of those nonprofits is Mary's Center, which has been helping immigrants in the Washington, D.C., area for years. Until recently, workers at the agency saw about five to seven newly arrived children each month. Now they're seeing that many every day, according to Maria Gomez, the group's president and CEO. She says many of the children have had horrific experiences, which will require serious counseling. Jose, 16, arrived in the U.S. in June. He says he feared throughout his two-month trip from Central America that he would be killed or kidnapped by gangs. His Aunt Marta, who lives in Maryland, says it was worth the risk, though, to get him away from the gangs back home. She says the family has been terrorized for years. "It was so hard for me when I got a phone call ... with the news my sister had been killed," Marta recalls tearfully, speaking in Spanish. She says two years ago, Jose's father and mother — who was five months pregnant at the time — were murdered for refusing to cooperate with local drug traffickers. Jose's three younger siblings remain in his village, living on their own. His sister is 15, his brothers are 11 and 7. He fears for their safety, which is one reason NPR agreed not to use his full name, or to identify which of three troubled Central American countries Jose is from — El Salvador, Guatemala and Honduras. "There are no laws where we come from — no police, no justice, no nothing," says his aunt. She says the family pulled together $4,000 to get Jose out before it was too late. Jose says he gave himself up at the Texas border and spent eight days at a detention center, where it was dark and cold. Now, he sits at a Mary's Center office in Prince George's County, Md. He's wearing black and white Converse sneakers, khaki shorts and a T-shirt that has pictures of surfboards on it and the words "Santa Cruz, Calif."
"I feel safe here, but I'm worried because my siblings are alone," Jose says in Spanish. Maria Gomez says stories like his are not uncommon. "So far almost every single one of the kids that we've gotten has been through some horrendous trauma," she says. She adds that many of the children have been physically or sexually abused, at home or on the way to the U.S. Gomez says one 11-year-old girl they're seeing was raped by the men her family paid to bring her to the United States. She's now pregnant. "One of the many who can't even talk anymore, can't even talk," Gomez says. "She has no idea what it all means, but she now is carrying this baby. And the tragedy of it all is that the parents are so overwhelmed, because they left her back home when she was an infant, and now they don't know how to handle it, and so she's being blamed for getting pregnant." So far almost every single one of the kids that we've gotten has been through some horrendous trauma. Other agencies say they're seeing similar cases — children with layer upon layer of problems that will need to be dealt with soon. The U.S. Committee for Refugees and Immigrants, a nonprofit that is helping the federal government settle about 1,000 unaccompanied minors, says more than 90 percent of the girls they're dealing with have been raped. Many of the groups, like Mary's Center, are now meeting with state and local agencies, trying to figure out who can do what, and how they can work together. But their efforts are somewhat hampered because the federal government can't tell them how many more children will arrive and when, and where they'll be living. Tom Harr is the CEO of Family Services, a nonprofit agency in Montgomery County, Md. So far, more than 2,200 unaccompanied children have been placed in Maryland homes, many of them in his county. He says it will be a challenge getting them the help they need. "I think the biggest concern I would have is our capacity, because our programs are already filled," says Harr. He adds that there are obstacles to providing services for children who are undocumented, especially for things like mental health, which is expected to be among the children's greatest needs. Daliris Amaya is a youth and family counselor with Family Services. She's already working with newly arrived immigrant children at a local high school. She says many of them are angry and confused, especially if they've rejoined parents who fled their countries years ago. "They haven't met Mom like in 10 years," Amaya says. "So [she's] a complete stranger to them. I have had cases that my clients didn't have a clue that Mom was pregnant or that Mom had another child. When they come here, [it's] 'Surprise, you have another sibling.' "
This comes on top of all the other stresses of being in a new country and not knowing if they'll be sent back home, Amaya says. Gomez of Mary's Center says her biggest fear is that these vulnerable kids will become prey to U.S. gangs, like those they were trying to flee in their own countries. Right now, Jose's Aunt Marta is more worried about finding him health care and a lawyer to argue that he should be allowed to remain in the U.S. She also plans to enroll him in high school — although back home, Jose stopped going to school in third grade. That's a challenge for another day.